Who doesn't love pies? I mean really, is there anything more perfect? From all American apple pie to rich, German chocolate. I love them all. And I love them even more when it's mini, because all desserts are even cuter when they are mini versions. Doesn't the little sugar encrusted lattice top kill you? It will slay at your next party! This recipe makes a perfect dozen that fits in your regular muffin pan. You can easily double this recipe if you are in need of more for your occasion. These pies can be served hot with a big scoop of vanilla bean ice cream melting on top or they are amazing cold the next morning (someone has been known to eat one for breakfast.. what? It's fruit...) And their small size will make it easy for your party - no messy cutting and serving! Are you looking for an amazing pie crust recipe? I was too and I found my favorite crust recipe over at Six Figures Under! This pie crust recipe is crazy easy, fool proof and makes 20! I know 20 sounds like a lot of pie crusts, but I think you will be surprised by how fast you will use them and they freeze wonderfully. It is a shortening based crust which is far easier to create during these hot summer months too. Do you have a favorite crust recipe? Let me know in the comments! When you go to buy your peaches, there are usually lots of choices: white, yellow, cling, donut, etc. For this recipe, any variety will be fine - just pick what looks the most delicious. I've baked with just about every kind and they are all wonderful. I haven't found that peaches get soggy in pies like some other fruits can. 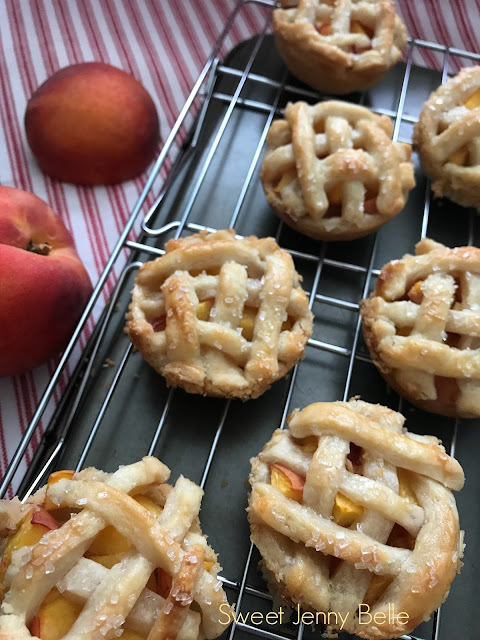 In this featured recipe, I used yellow cling peaches and they were yummy! 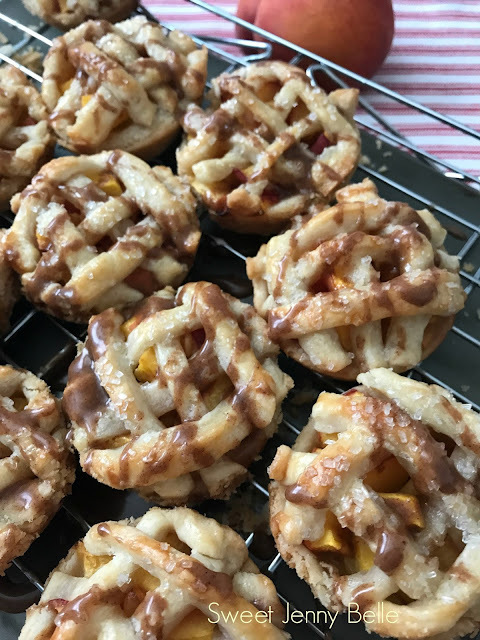 These mini lattice topped peach pies will be wildly adored before they are gobbled up. Full of fresh chopped peaches and topped with a sugar crust drizzled in cinnamon glaze. Preheat oven to 375F and pull out a muffin tin. Roll out one pie crust on to a floured surface. Cut 12 pie crust circles - I used the rim of a water glass, but a biscuit cutter is perfect too. They are approximately 3" in diameter. Gently press each pie crust into a muffin hole. The dough will not reach up all the way on the sides, that's ok! In a medium bowl, gently toss the chopped peaches with cinnamon, ginger and brown sugar. Place large scoops of the peach mixture on the pie crusts. Roll out the remaining pie crust on to a floured surface. Using a pastry or pizza cutter, cut 1/2" strips of pie dough. Trim those pieces to about 3" long. Lay a lattice of pie crust on each muffin tin - I used 3 pieces in each direction. Gently press the sides of the lattice crust on to the bottom crusts so that meet and touch. Paint the egg wash on the tops of the pie lattice and generously sprinkle sugar over them. Bake for 25 -30 minutes, or until the pies are a beautiful golden brown. To make the glaze, in a small bowl beat together powder sugar, vanilla, cream and cinnamon. It will be a beautiful brown, smooth icing. Using your fork, drizzle the glaze all over the hot mini pies. Enjoy! 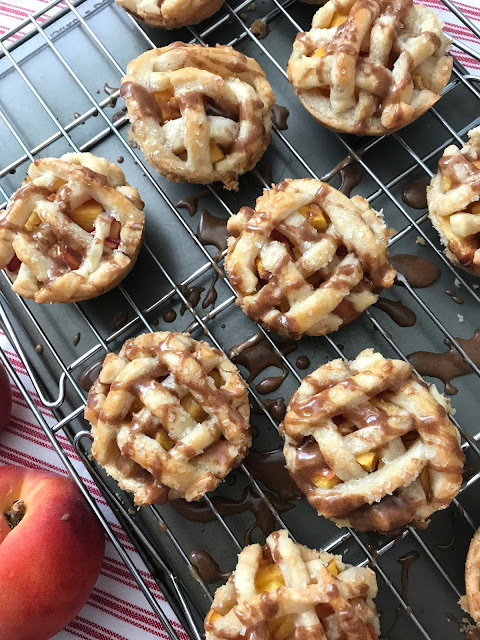 These mini pies are delicious hot from the oven, but my favorite way to enjoy them is cold from the fridge the next morning. Any leftovers can be refrigerated for 2-3 days. I really wanted to add a sweet glaze to the tops of these pies, to make them a bit more like peaches n' cream. However that step isn't necessary. As you can see from below, they are gorgeous without the icing and are every bit delicious. Feel free to eliminate the glaze from your topping if so desired. Mini pies are one of my absolute favorite summer desserts. It seems like all the parties are headed to the patio and my kids are running off as soon as the meal ends. So convenient to be able to hold these in your hand to enjoy - no messy cutting or stacks of dishes. It's super easy to change up with different fruits too! 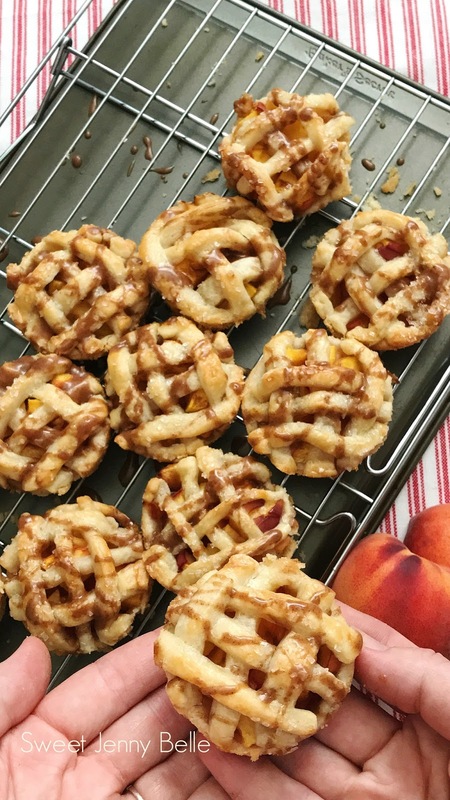 These mini pies look so great! I can't wait to try. Thank you for sharing the recipe! This piece of writing will help the internet people scr888 download for setting up new webpage or even a weblog from start to end.